We are getting into the Christmas spirit at our house – crafting, cooking, singing, and giving thanks for a Savior in a manger! As the kids get older and the weeks get busier, I’ve learned to focus on a few meaningful activities that they enjoy. We want to remember the peace of the season, not the frantic craziness. 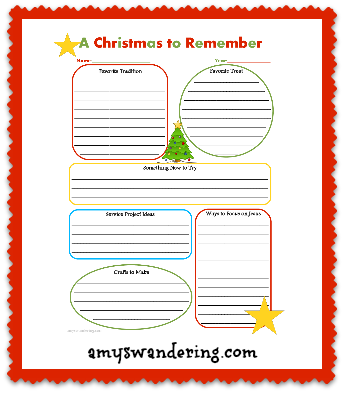 I created a Christmas to Remember printable for my kids to fill out with their holiday favorites. Print it out for your kiddos and have yourself a merry little Christmas instead of a weary one! Thank you for all of the resources you provide! We look forward to the monthly “celebrating” packets!